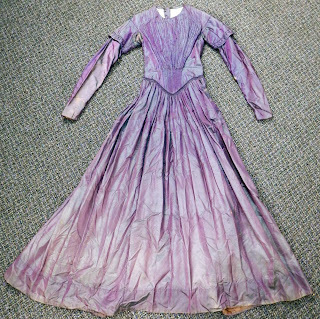 *This is an antique dress, another from the Sycamore estate of the grandson of a Civil War General- General Everell Fletcher Dutton. He was a member of the 13th Illinois Volunteer Infantry, later commissioned a Major in the 105th Illinois Volunteer Infantry where he was ultimately promoted to General. This dress we believe belonged to his wife, Rosina Adelpha Paine Dutton, who resided in Sycamore Illinois. They were married on Dec 31, 1863, while Major Dutton was home on leave. I am also including 5 original Civil War letters from Rosina to her husband General Dutton, from March 1865, and one from when she was his fiance in August of 1863. These are original letters, not copies. (photo of her is not included). 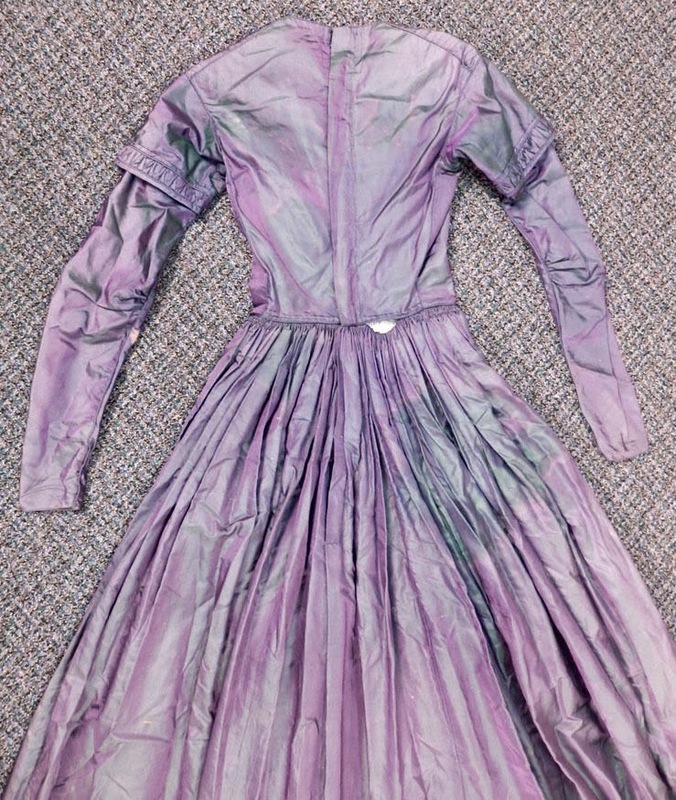 This dress must have been very special to her as it was kept in the family all these years. The Sycamore Historic Museum will be having a display devoted to General Dutton in 2014. 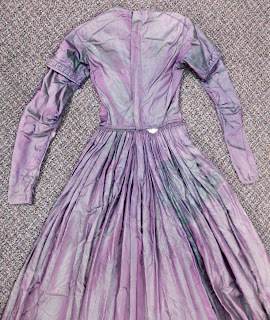 This dress is color change silk, when it moves it looks purple and then green. 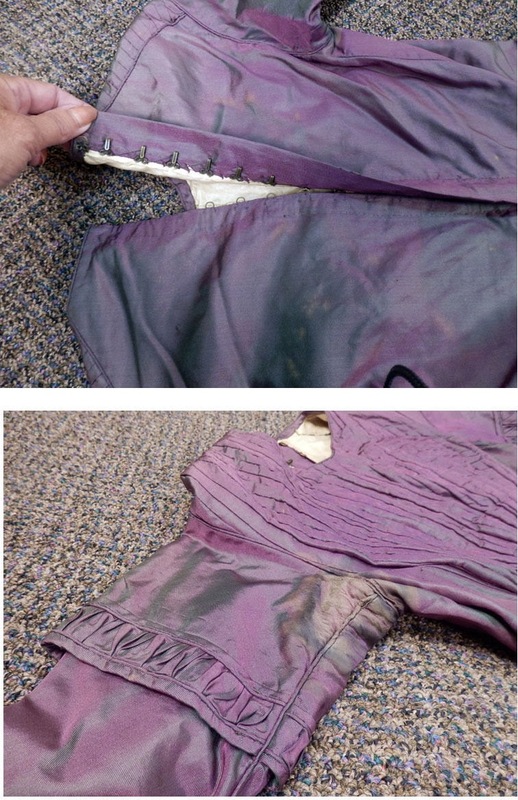 You can see the green threads on the inside of the dress. 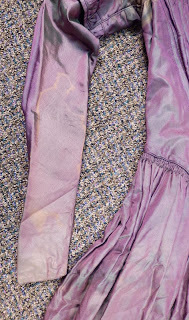 Stitched detail on the front bodice that ends in a lower V shape. Straight sleeves with small cap sleeve over the upper part. 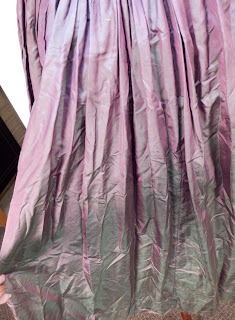 The back of the dress has very sturdy hooks and eye closure, none missing. 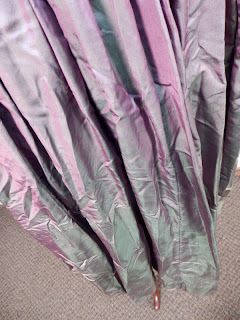 The dress was smaller than my dress form could accommodate so we photo'd it flat to show the entire dress however the camera lights reflected off the lower skirt. It is not as faded as it appears in the full length photo, the light is closer to the lower edge of the skirt. 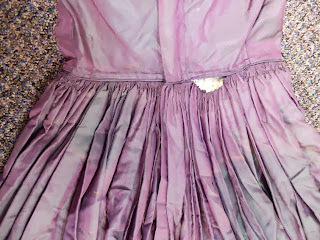 Please view all the photos as the dress is in very good condition. 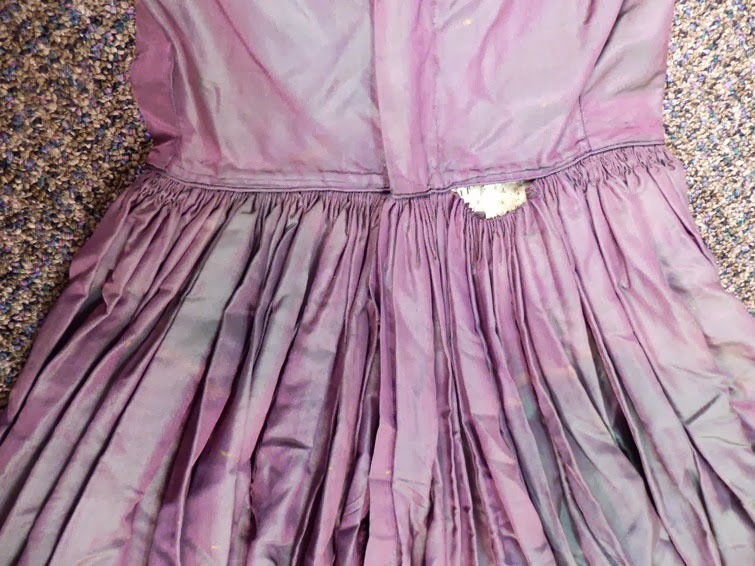 The dresses from this estate are in very good condition for their age. 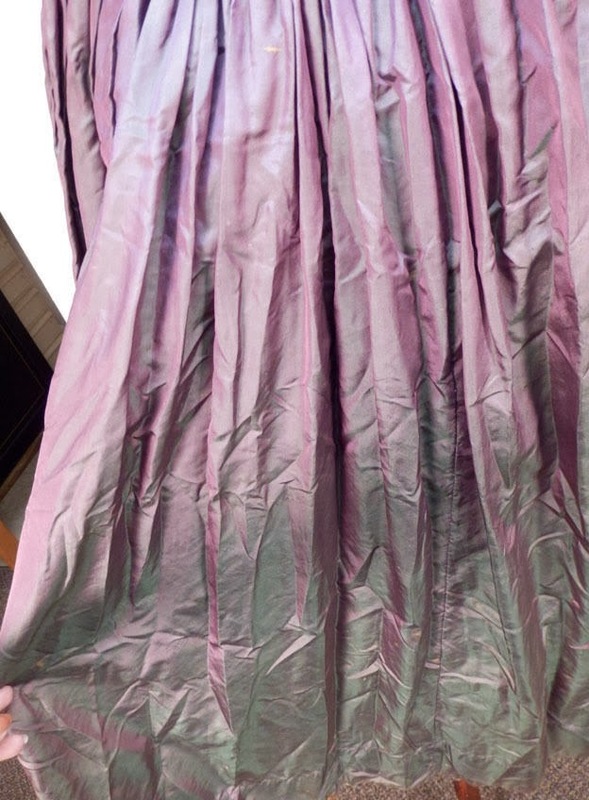 Here is what I observed: There are some brownish lines on the skirt, hip areas and on the r. sleeve - a 2" area of the skirt is pulled out of the waist seam - inner chest polished cotton? lining is good condition - a few-some small holes in skirt - underarms have discolor - has an odor as do most fabric items this old. It displays nicely but will need a small dress form. 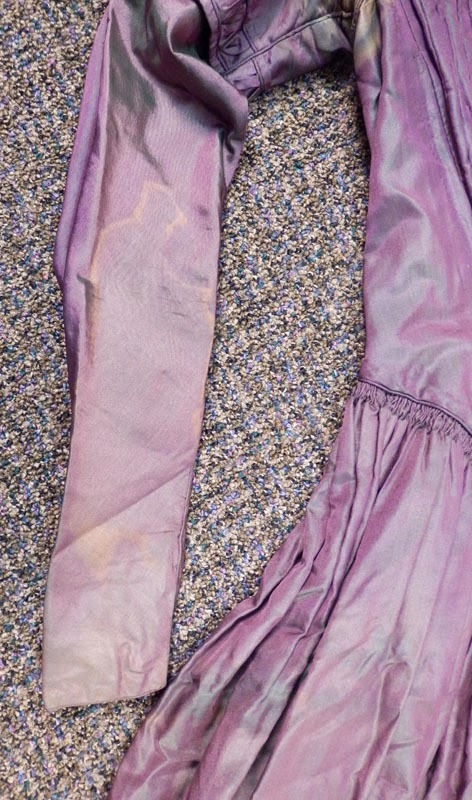 Please view our other listings for more clothing from this estate. 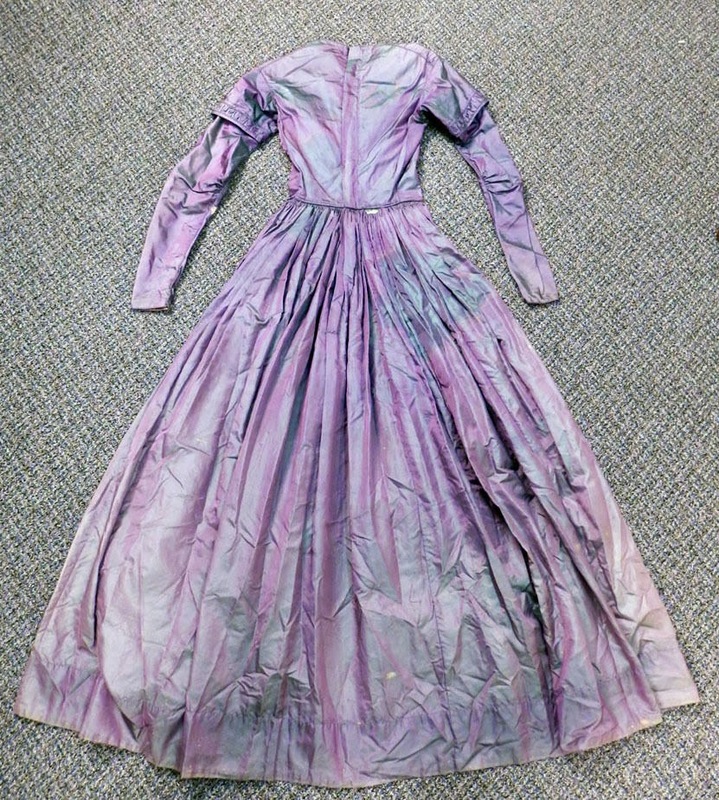 The elongated waistline, fan bodice front, and lil cap sleeves over the longer sleeves are all tell tale signs of the 1840's. 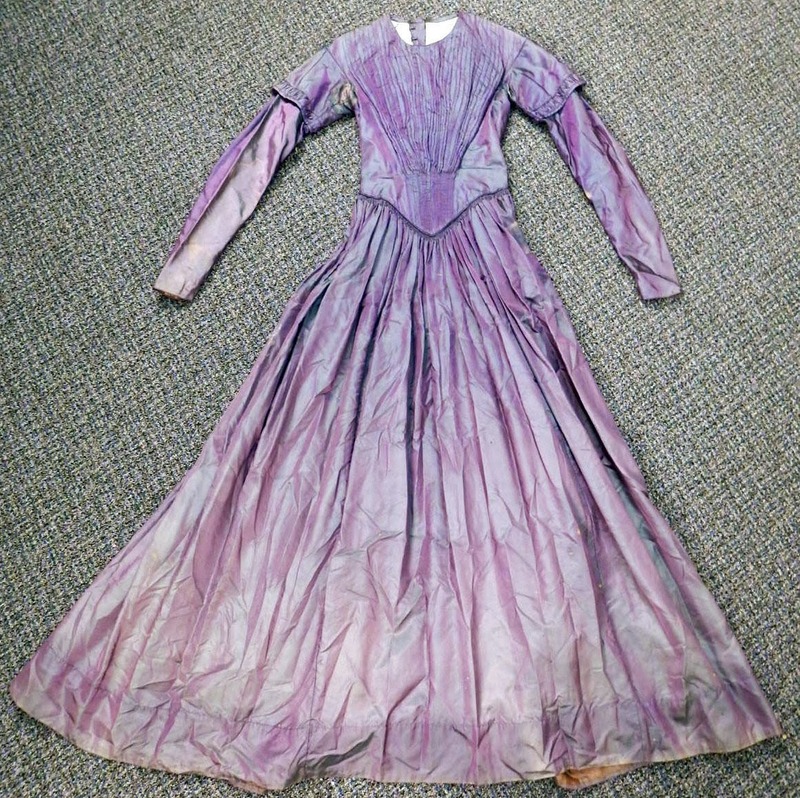 Fabulous dress but most likely Rosina's Mom's wedding gown and not her own gown.